Whether you're looking for a serious workout or just want to enjoy comfortable and fun outdoor exercise, the ElliptiGO is the perfect tool. You can cruise along the beach path, cross-train for a 10K, or get in an intense workout in your neighborhood. The 3C is the most cost-effective way to enjoy the ElliptiGO experience and get the benefits of low-impact exercise outdoors. 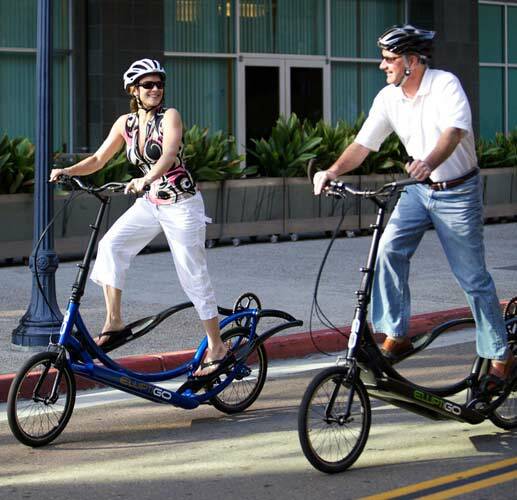 The ElliptiGO is the world's first elliptical bicycle. Designed by runners as the ideal cross-training device, the ElliptiGO combines the best of running, cycling and the elliptical trainer to deliver a low-impact, high-performance workout outdoors. We believe it is the ideal cross-training device for healthy runners and the best replacement for running for injured runners. It delivers an exercise experience that is closer to running than anything else available today. Michael V.I've had my 3C for 6 months now, riding just about every day, and have put on 1300 miles. I still enjoy every ride and the workout is equivalent to when I was running but much more fun. The 3C is very well made and I have had no issues other than enjoyment. Tom R.My Elliptigo is the best thing I've spent my hard-earned money on in a long, long time! The build quality is exceptional and the ride is smooth and fast. I ride hard all the time and am hoping to do a century ride this summer. I'm a beat up runner and former gymnast, and the Elliptigo allows me to get my heart rate up in a way I can't on a regular bike, and I can wander around and explore while getting an excellent workout. I recommend the Elliptigo to ANYONE looking for a good, fun workout on a quality machine! Steve A.When I made my initial inquiry into the ElliptiGO I was a little hesitant since I had never tried one before and was concerned about the performance I would get from the 3C. The ElliptiGO 3C is exhilarating to ride! Pros: It’s mechanically well designed and very capable for moderate hills. The ElliptiGO workout is much more intense than what a regular bike can offer. I typically run 3 to 5 miles/day and would love to run more but my body just can’t take the bone-crushing impact that running causes. With the ElliptiGO I can literally run all day without the pain I get from running! It really is like running on air. The only pain is pure muscle burn. Cons: No shock absorbers. If your existing bike has them then you’ll need to adapt. The gliders do require regular cleaning. No big deal. I use a damp Scotch-Brite sponge that I cut to size so it easily fits into the glider slot. Mike G.I endured my first ride with the Chicagoland wind in my face (day 5). I felt like a mack truck breaking through the wind with a lot of resistance creating a more challenging ride. Forget the 11c when you live in the midwest. After about 45 minutes, my hands felt like I had been golfing all day without a glove. The handles are not as comfortable as they could be. I will say that I had no aches and pain on this machine as I do with treadmills/bikess/running. Diane C.I absolutely love the ElliptiGo 3C. It is so much easier than running (on the body) and so much more fun to do. The only place I ride is around my community, but it is really enjoyable. One main difference between the 3C & running. If one needs a break, they can always coast. Can't coast when running. I ride as often as possible 4 - 6 days per week at minimum for 1/2 hr. each time. Ellipti-GO - seniors! Francisco A.I have had my Elliptigo 3C for about 3 months and almost 200 miles. I ride it 7 miles a day 5 days a week in and around bike trails and sometimes traffic. I have had it up to 23 MPH but on average it goes about 17 MPH against the wind. Considering it weighs in at 37 lbs its a miracle I could maintain that speed for long but you’ll notice that it glides nicely when coasting. I currently have my Elliptigo in the shop to repair some hub noise and I cant wait to get it back. Great Idea, but needs some work! Jeanne D.Sound from the tracks and friction considerable. Lot of maintenance to keep tracks free from dirt. Tires are very hard, little cushioning. For Colorado Springs more lower gears. Even cheapest one is extremely expensive. Awesome idea, but needs some more work. For price 11c should be carbon fiber. Great quad/hamstring workout. Too heavy. Paul T.Overall, the ElliptiGO 3C was very well handling and easy to ride compared to other 2 wheeled vehicles. For me and where I would ride, the 3C needed two additional lower gear ratios. The hills on my test ride were difficult to climb without lower gears. I am probably a better match for the ElliptiGO 8-speed product. The down shifts were smooth to engage, but up-shifts seemed a little “clunky.” The handle bar comfort seems good and the adjustability is a good feature.